but below the secondary air gap. 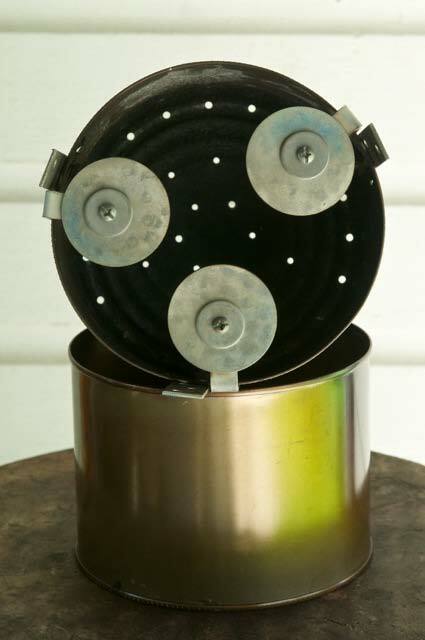 This design is typically yielding abut 22% of the feedstock's weight as biochar. clean stack gas. I wish the many small diesels out there burned nearly as cleanly. the fire from wind gusts. I have varied the size of the gap. The larger the gap, the weaker the draft on the primary air and the more the syngas is cooled, the longer to cook or boil water. If the gap is too small, the primary air draft is stronger, but the syngas does not have enough secondary air for a good fuel/air mixture. It's a Goldilocks thing, too big, too smal, or just about right. The gap will vary with can diameter and feedstock type and condition as well. I doubt very much that it is a fixed dimension. 3. An attachment point for the three draft deflectors. 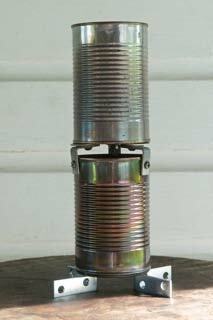 mixing chamber in the top half of the bottom can. 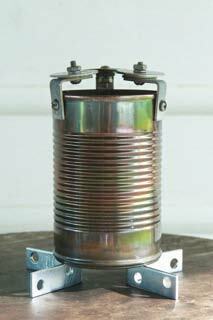 I realized the arms of the brackets, in the small can, were essentially forming a weak concentrator effect. So I added some handy washers to enhance the effect. I was surprised at how very well indeed this approach worked. Watching the flames looks very much as they are deflected back into the "mixing chamber" in the top half of the feedstock can. 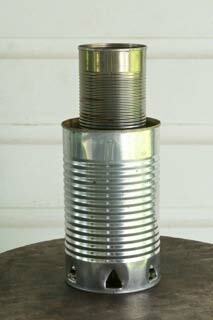 Note: this design works even when the feedstock can is 75% filled. hear the noise it makes. inner ring of five (5) 3/32 inch holes. Run time is relatively long for 130 grams of wood pellets, but yields good results. Enlarging the inner ring of holes to 7/64th would speed things up. standing on its three small angle brackets. The primary air gap is about 2 cm. A secondary air gap of about 1.5 CM works well. The tuna can is about 60% of the height of the Costco coffee can. Height is 11.5 cm. using this gives me an option to create less draft than a taller can. It also more evenly distributes the heat in the container as it is not as close to the cooking surface. 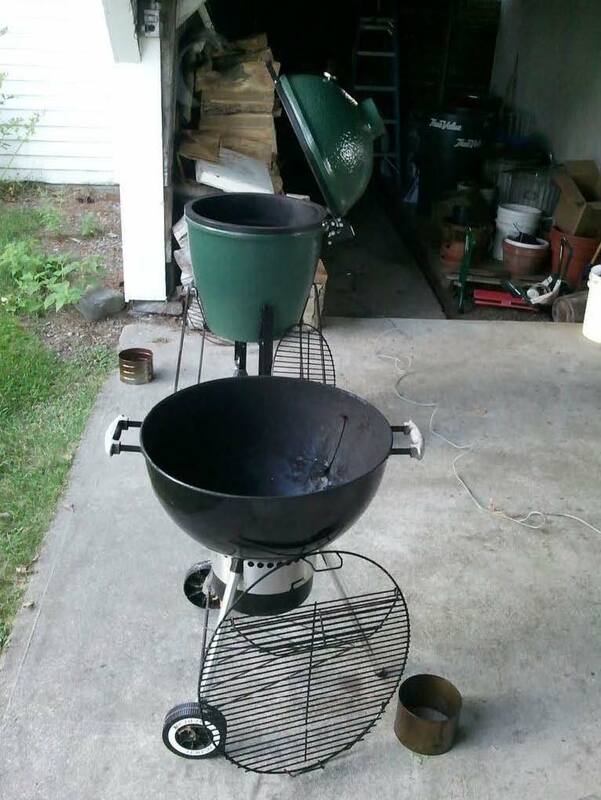 The two tuna cans system will get a BGE all the way to 420 degrees. It will hit 350 degrees with about 2 minutes and hold there for about 12 more minutes before the temp rises upwards towards 400. 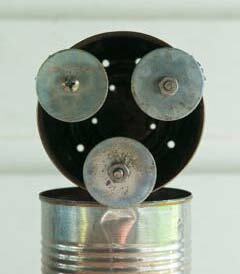 The three deflector washers are 2 inches, or about 5 cm, in diameter. Inner ring: 3 holes @ 1/8th of an inch and 3 holes @ 7/64ths. When used in a kettle type grill, the air inside the grill will reach 440 degrees F.
My secondary air gap conveniently aligns with this ring of air supply holes. wood", not charcoal. You will be making charcoal, not burning it! As you will not be touching the TLUDs below the grills, you can stir thing vigorously. [RWL: Can you describe more about your "quenching." I now do a multi step quench. Weigh can as it comes out of the grill. Check bucket after a few minutes to see if the smoking Biochar has deposited any creosote on the inside walls. The goal is vanishiingly small amounts of creosote deposited. 1. Pour hot charcoal into a mason jar and seal. This gives me bone dry charcoal in a few hours. 2. Pour the hot coals into a clean can and cover slowly with water from a height so as not to get burned by the live steam. I use a second container for this so as not to pick up any creosote that might be in the first bucket. I want to smell the charcoal, not any creosote deposited in the first can. This gives my absolutely safe, water saturated charcoal. 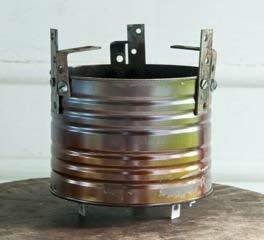 Eliminates fire risks and burn risks. Important when teaching other people of all ages. The water quench also allows me to check for floaters and ash content. You do not want milky quench water. I take the bucket of biochar and water inside, pour it into a large sieve, collect the water mixed with charcoal dust to use to water plants, and then dump the drained biochar into a bucket. I use a lot of this in my kitchen compost pail -- liberally cover the bottom of a rinsed out pail before adding more scraps. Add more biochar as the pail fills. Odor control and pre-mixes compost and biochar before I take it to the compost pile.